Are you an experienced trainer and CTI practitioner interested in becoming a certified CTI trainer for your agency or team? If so, please consider joining trainers from CACTI this summer in Washington, D.C. for a 2-day “Train the Trainer” event. The training will take place July 21-July 22, preceding the National Alliance to End Homelessness’ annual D.C. conference. 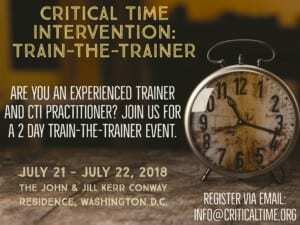 Please inquire with info@criticaltime.org to determine if you or your agency are eligible to register for the training and to discuss pricing. We look forward to seeing you! We are interested in having trainers from Toronto. What is the cost for the training and how do we register staff? I just replied to your inquiry about TTT via e-mail, though in response to this question it would be best to fill out an in-person training request if you have not already (linke here. The cost varies by number of trainees and travel, so inquiring directly with our training partners, who will receive the on-line request, is the best first step.